Some years ago was I snorkeling in the Caribbean. Suddenly did I feel a burning pain on my arm. I had hit some tentacles from a jellyfish (which I never saw). When I returned to the beach, I had painful, red stripes over my arm. A local man gave me the following advise: "Put your arms in the sand, and the pain will go away." It did. Jellyfish and Scorpionfishes have a venom that disappears when the area is heated up to 42-45 degrees Celsius (about 110 degrees Fahrenheit) for 15-20 minutes. You can use warm sand, warm water or anything else that is warm (not burning). However, if you have been stung by a Stonefish, you will need medical care at a hospital, because the venom is so strong that it can be lethal. This is a False Stonefish photographed at 50 cm depth. You may not see it while you are walking along the reef. 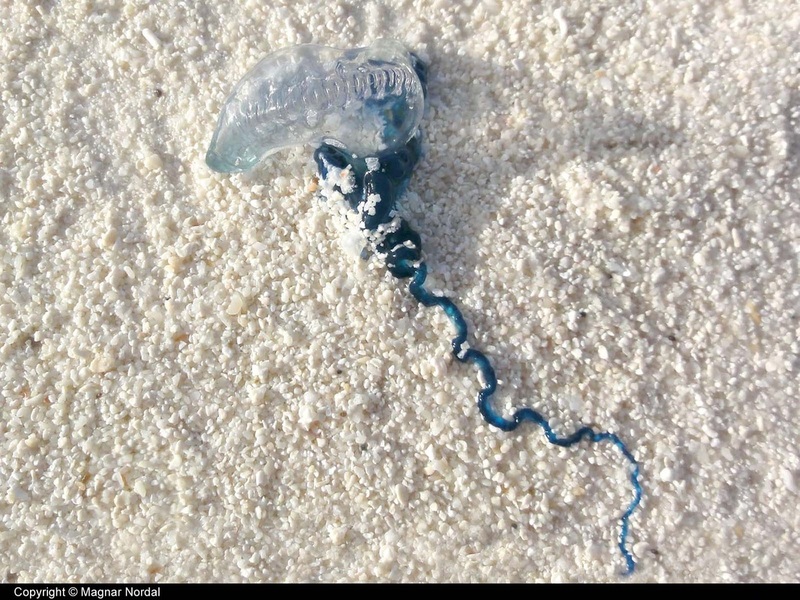 Portuguese Man-of-War can deliver a painful sting, even after washed ashore.